Usually when we talk about using containers for workshops, we’re talking about 1-3 containers being used as a covered work area. Some are basic containers with shelving put in. Others are insulated and have HVAC units so they can be used year-round in different locations. 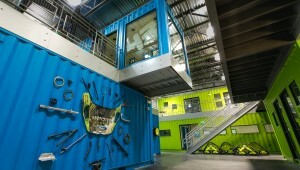 Some people put 2 containers parallel to each other and span a roof between them for additional space. And then there is the new Hoonigan Racing Division Headquarters (formerly the Monster World Rally Team). 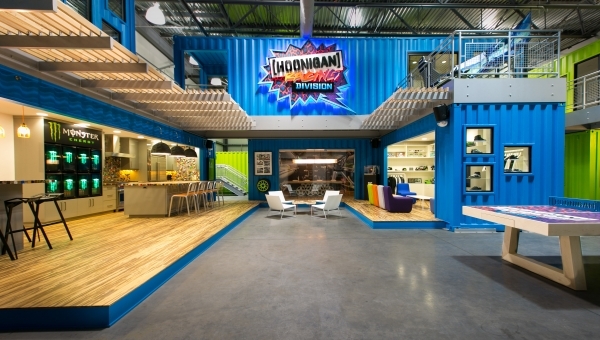 Ken Block, co-founder of DC Shoes and professional rally driver, built this 12,000 square foot building to house both his creative office and a workshop for his team’s race vehicles. The 17 storage containers inside the building are used for office space, conferencing space and in his workshop. Block explained he used containers to give him the flexibility to change the design inside the container as his needs change. While most of us probably won’t have something quite this amazing, it is wonderful inspiration for more modest workshops and office space. For more information, check out the team’s blog. As always, if you want a better look at a picture, just click on it.